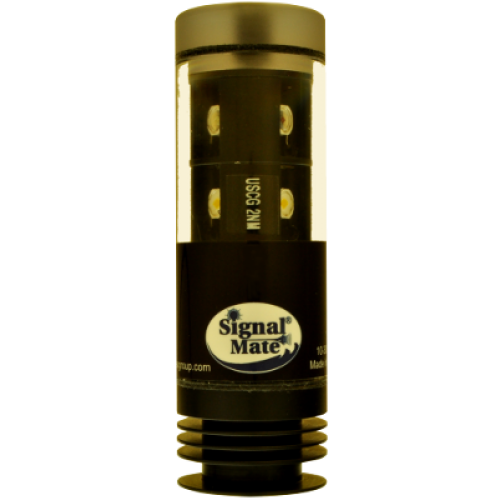 The Signal Mate Bi-Color LED Running Light is a combination port & starboard navigation light certified for 2 nautical miles (20 meter/65 ft. boat) by the US Coast Guard. It can be mounted with an included bracket to point where desired. Solid construction and waterproofed components combine to bring a long-lasting, high-power navigation light to boats up to 65 feet long at an affordable price. The low power consumption and long-life LEDs make this light the ideal light for port and starboard signaling. Click here to view the Bi-Color Running Light Drawing. Click here to view the Bi-Color Running Light Spec Sheet. Click here to view the Bi-Color Running Light Owner's Manual. Mounting: 1/4 x 20 female threads atop and bottom of light or included adjustable bracket.